Belts and Briefcases would like to say thanks to all the wonderful customers below who kindly wrote in to give us their feedback. We hope to see you again soon. "I was very happy with the money belt. Thanks." "My belt arrived in double quick time. A quality item at a great price and much admired for its looks. Thanks again"
"The bag is here and I love it, also the scarf is great." "I've received my order on 07.02. I'm absolutely happy with my purchase and with your company's customer serviss! Thank you very much." "Just a quick message to inform you the parcel has arrived. Everythinh was there, very nice quality, very pleased. :)"
"My order was delivered safely on Monday. Very pleased with the goods ordered, competitively priced & fast delivery. Many thanks." "Thank you, it arrived on time and in perfect condition." "Thank you very much for an excellent online shopping experience! I purchased a Troop London bag from you rather late on Thursday evening and it arrived this very Saturday morning." "I received my deliver and I am very happy with the two belts I purchased. I would be pleased to shop from your website in the future." "Very happy with purchases. Service and delivery were excellent, and particularly liked the sizing guide, which was very helpful. Would definitely purchase again if looking for similar items." "Many thanks, yes received my order and am happy with my purchase. Thanks for prompt service." "I received the delivery and I'm very happy with the quick service and the good value." "Order received and I'm delighted with the item - many thanks." 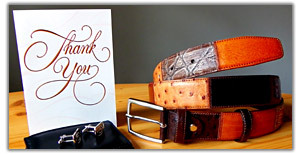 "Recieved our recent order of a belt very promptly, wonderful service and a good quality item." "All received, good condition, good product, good service, so thank you very much"
"I have receiced the troop bag and am very happy with it. Many thanks." "My husband was very pleased with the belt... he was very pleased with the quality of the belt and your service was very prompt." "Delivery arrived no problem thanks. Easy to order, very good service and product arrived promptly." "Received belts, top quality fit true value for money and a special thanks for a very good hands -on service." "My bag was received promptly and I am very satisfied with the product that I purchased from you." "The new bag arrived thanks and it's fine. Thanks for your excellent service." "Purchased 2 belts from Belts and Briefcases. Both are excellent quality and the delivery times (bearing in mind delivery is free) are excellent. No complaints!" "I think that Belts and Briefcases have been fantastic. The bag is perfect and delivered very promptly. Thank you." "It was very quick, your service is superb, your price on that item was the best. My girlfriend is very happy with it. Thank you all ever so much." "Many thanks for the first class response and delivery. Very happy with the item and would certainly order from you again and recommend you to others." "Excellent service thank you. Ordered belts on Wednesday evening and received them on Friday. Very pleased with the quality and pricing."